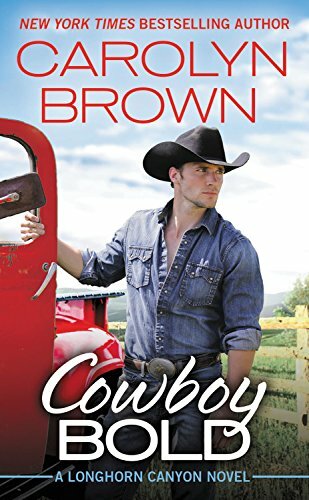 Typically, when I gush on and on about a favorite romance novel, it’s the hero I’m most taken by, and while Cade Maguire is indeed worth gushing over, it was the story arc and character of Retta Palmer that made me cry and declare this is my favorite of all Carolyn Brown novels. Retta Palmer needs a layover job until she can interview for a bank job in Dallas, her dream job she had before her father took sick and she quit to go home to take care of him. But now with her father gone and the home farm sold to pay medical bills, Retta is at loose ends until the end of summer when she can go apply for the job she really wants. In the meantime, holing up at Cade Maguire’s ranch, mentoring a group of young girls, seems like a pleasurable way to spend her time. But it turns out to be even more than that. Everything about being on the ranch feels right, from her time spent with the girls to every clandestine moment spent with the hot and handsome ranch owner. Still, she’s not ready to give up her dream job to live in the middle of nowhere and farm. It was why she left home all those years ago in the first place. It doesn’t help that everyone from his brothers, to the elderly caretakers, to the kids themselves are all conspiring to make the match work. How do you choose between two loves? For me, it was Retta’s interaction with the troubled girls who were spending five weeks on the ranch as part of a program to rehabilitate them. Most are from foster home situations; all from poverty and destitute circumstances. Honestly you won’t know which little girl you like the most because they’re all adorable and all hilariously annoying and competitive. While Retta rides herd on the girls, Cade has his hands full with the boys who are also part of the program, and each of them are funny and broken and loveable. This is a book of healing. Retta who is healing from the loss of her father and her childhood home; Cade who is healing from the heartbreak when he was jilted at the altar a couple years ago; and the kids, who all have their own issues and situations that no child should be burdened with. This book made me cry a lot and made me think of my father. For me, this is a 5 star Top Dish because this felt like a book written just for me, and I thank Carolyn Brown for it. It was a very healing book. I can’t wait to read the other books in this series; and I rather hope we get to see the little girls again. I was really hoping Cade and Retta would adopt one. Fingers crossed. Thanks for heads up. I love Carolyn's cowboy books and this series sounds wonderful. You have made this sound like a story to touch my heart. Thank you. Well this is my favorite book so far, so I recommend this one; however, the last series she had was good as well. One of them had a war hero who knew the husband of his widowed neighbor...and it was a very heart-touching story. I love reading Carolyn's books. I can't wait to read this one! I haven't read anything by this author but this one sounds really good. This one is REALLY good. :) But again, as I said, I have a similar life experience that made me really in tune with the characters. But Retta is really special. Isn't it wonderful when a book touches you this way. It will not speak to everyone as it spoke to you, but that doesn't lessen how good a book it is. This has everything that I like in a book, and I'm sure to enjoy it. Exactly! I knew when I read (and sniffled) my way through this book that this was just a very SPECIAL book for me, but it made me stop and think of how many books authors create for us readers...and how each of those books touch a handful of people who really needed that story...and it really just re-filled my sense of wonder at how magical stories really are. I hope you enjoy the book! Sounds good. I must read it! Thanks.